I have been meaning to post about my outdoor deck for months now. Last year, I moved into my apartment in June, and by the time I organized the inside, it was too late for the small deck and any outdoor decor. This summer I knew I wanted to focus on the deck. 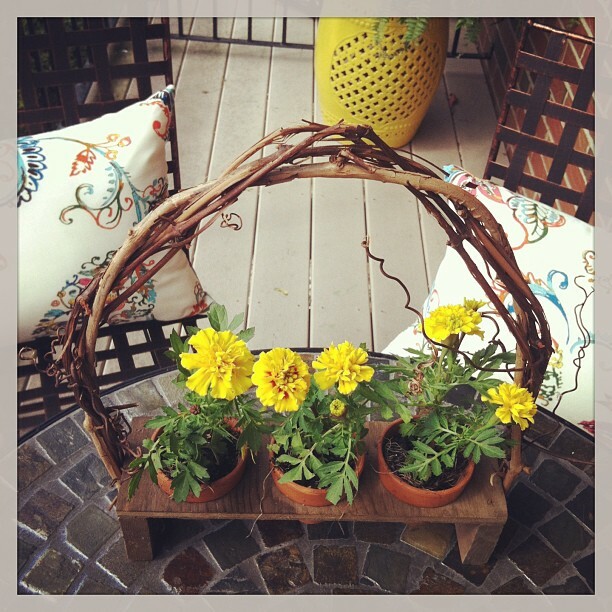 I searched Pinterest with a theme in mind of bright colors with some rustic elements. This image was exactly what I wanted to recreate. My deck is long but narrow so a tough shape to work with. My friend's hubby is very handy with creating wood furniture, and he graciously agreed to take on creating a custom bench for me. I hadn't seen anything I liked and knew I wanted something like this. We went to a lumber yard in Cambridge (stopping for donuts along the way) and found the perfect pieces of wood. It was such a fun and more special experience than buying something online. Just a few days later, the bench was delivered, and it was perfect. I joke that I want to bring this bench to my wedding to sit on, I love it so much. Stay tuned for tomorrow's post on his design process. For the decor and seating, my mom helped me pick out items from Target, World Market, Pottery Barn, and home decor sale sites. I also did some thrifting in Rhode Island & Maine. After installing those, the last piece was the flowers. We went to Home Depot one Sunday and bought a wide variety of blooms. I am notoriously a brown thumb (which if you follow me on Instagram, you know most of these flowers are now dead), but when we first planted them it was a beautiful & colorful sight! 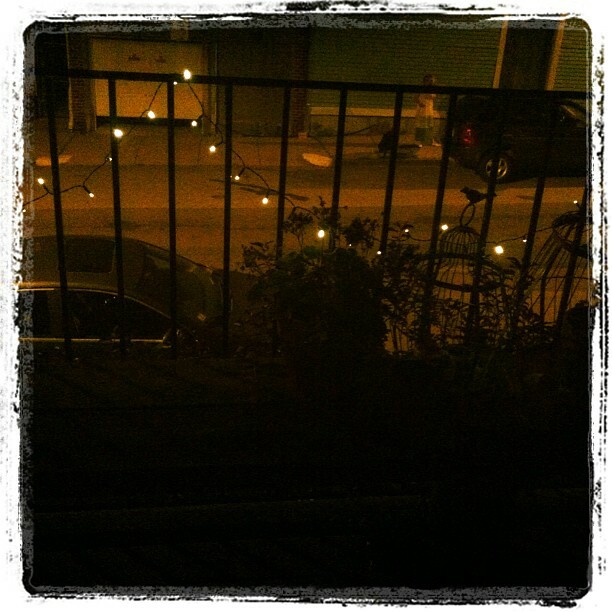 Lastly, I added solar lights that I love seeing blink on each night from my living room. what a cute deck - love the rug!! love this! it's so livable and reminds me of Justina Blakeney and her jungalow - well done! Wow Jaime! Stunning transformation! So cozy! I want that rug; love it! Well done!! Wow, this is stunning. Such an amazing job. You did such a nice job with the deck, Jaime! It looks beautiful! This looks great! 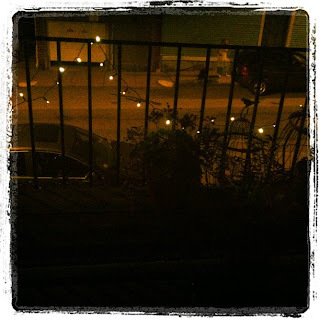 I'm looking for stuff for my balcony and its a similar set up! thanks for the inspiration! I love this - you and your patio are so cute!!! your deck is insanely cute!! What a perfect little outdoor space! LOVE this! I feel like I would be terrible at decorating a deck because it'd be the last place I'd think of! 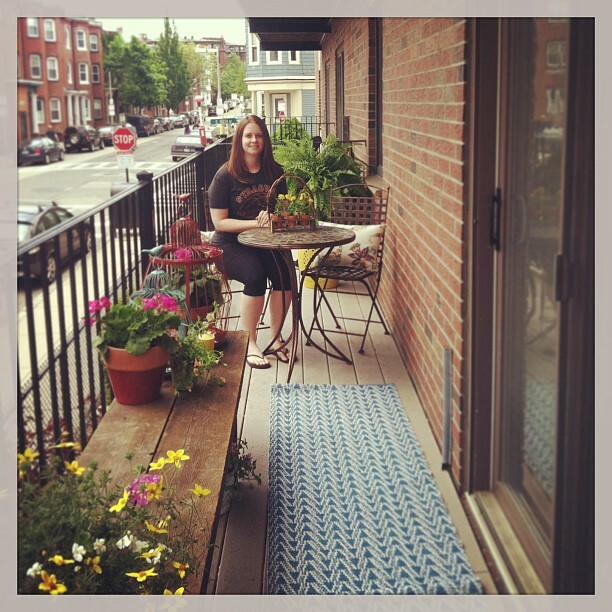 your porch is adorable! i love everything about the space.